Barking Rabbits: The wit and wisdom of Rocky and Bullwinkle, as it applies to the administration of George W. Bush. The wit and wisdom of Rocky and Bullwinkle, as it applies to the administration of George W. Bush. Bullwinkle: You just leave it to my pal Rock. He's the brains of the outfit. General: And what does that make you? Bullwinkle: What else? The executive. Rocky: And now, here's something we hope you'll really like. The Announcer: Well, you're just in time for what might be a very unhappy ending. Rocket J. Squirrel: And now, here to tell you everything about anything is Mr. Know-It-All. Dudley Do-Right: Stop, Snidely Whiplash, in the name of the law. Bullwinkle: I'd like to apply for a job as an usher? Boris: What experience have you had? 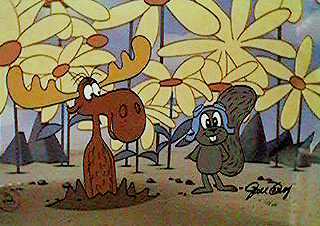 Bullwinkle: I've been in the dark for most of my life.